Tomorrow marks the official start of the NFL season, and I feel just like a princess. And this princess is ready to finally take her rightful place on the throne as Queen of Fantasy Football. Let's take a look at the heroic knights--err... football players--who are joining me on my quest to rule this mofo kingdom. Oh... and as you'll note, I still haven't quite recovered from the awesomeness that was Queen Bey's performance at the MTV VMAs, so I've borrowed some inspiration from one of only three reigning queens I recognize (Elizabeth II and the surviving members of the band Queen are the other two in case you were curious) to help me build my team confidence. Quick Overview: This is my first year as a member of this league. The only person I know is the league commissioner, and I had a fair mess of butterflies fluttering in my belly when I set out to draft a team. I had the second pick out of 12 teams, which is a mixed blessing position. On one hand, I had the second overall pick. On the other, I had to sit and wait for 20 other decisions to be made before I could make my second decision. Also, with only a minute and a half for each turn, I had to be lightning fast to make each of my choices. I know this sounds like I'm making a lot of excuses, but I'm not. I fully embrace, or at least accept, my team, I just hope you realize how angsty I was about the whole damn thing. What the Yahoo Experts Say About My Team: Coinciding with a juicy draft position (second overall), Lady Chapman had an outstanding performance. They're projected to finish second in Footballin' League with a record of 9-4-0 (1,202 points). They are clearly planning on cramming it down their opponents cramhole, using four of their first seven picks to add RBs Jamaal Charles (first round), Shane Vereen (fifth round), Bishop Sankey (sixth round) and Chris Johnson (seventh round). They landed one of the worst groups of WRs in the league, as they have Antonio Brown, Pierre Garcon, and Kelvin Benjamin. What I Have to Say: Three words: Aaron Effing Rodgers. For those of you following my attempt at a happily ever after for the past couple of years, then you know my hope and dream every year has been to have Aaron Rodgers on my team. And this year it finally happened. There's a lot of other decent talent on my team (though I really should have done a better job stocking up on wide receivers--but it's not a PPR league and receiving TDs don't get as many points so whatevs), but when I look at this roster all I really need to see is Aaron Rodgers, my original FF dreamboat. Quick Overview: I ended up securing the second place trophy in this keeper league last year, which admittedly gave me a little more confidence going into this draft. Add in the fact that I could keep two of the men I fell in love with last year, and I was pretty excited. Unfortunately, a little glitch with Yahoo's system effed up our first attempt at a live draft, so we had to do a repeat performance later. Thank God. I would've cried had I been forced to play with Johnny Manziel as my backup QB (no thank you, world). Because I finished second last year, I had the 11th of 12 overall pick for the draft, which was fine by me. 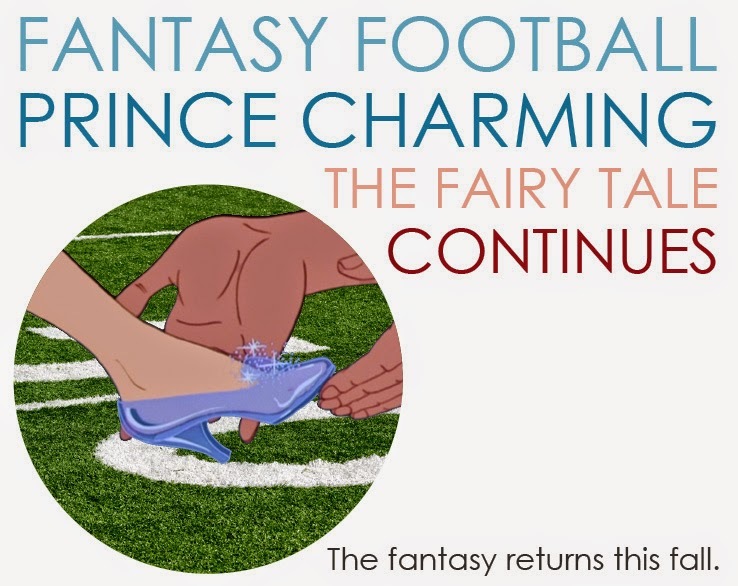 What the Yahoo Experts Say About My Team: A late round draft pick would fluster the novice fantasy football manager, but this was obviously not the first rodeo for Cinderella's Fellas. They were able to flip the 11th overall pick into an expected finish of second place with a record of 12-2-0 (1,622 points). They loaded up on ball carriers early, using three of their first five picks to scoop up RBs LeSean McCoy (first round), Toby Gerhart (third round), and Joique Bell (fifth round). These players will be heavily relied upon by Cinderella's Fellas, as they are one of the most prolific groups of RBs in the league. Cinderella's Fellas took advantage of two of their three keeper positions to retain LeSean McCoy (1.5 ADP) and Peyton Manning (11.1 ADP). From an ADP perspective, both of their keepers are of first-round quality. Overall, the keepers on Cinderella's Fellas are projected to be significantly more productive (by 18.3%) than the draft picks they replaced. What I Have to Say: Dude... did you notice that I'm expected to finish second in both of my leagues? I mean, I know pre-season projections are basically full of crap and Yahoo can't predict a championship, but... can't you feel it? That amazing sense that this is my year? I'm pretty pleased by this team, and while I'm not guaranteeing I'll exceed Yahoo's expectations and finish first, I do take comfort in knowing I put together the best team possible with my options. Also... PEYTON MANNING LESEAN MCCOY OMG OMG OMG!!!!!! It is going to be a delightful quest for my kingdom. I look forward to sharing it with all of you in the weeks ahead of us.